I am very excited to announce that this is my first product review and giveaway, brought to you by Lauren Nicole Gifts! Lauren Nicole Gifts has a wonderful array of merchandise that can be personalized and monogrammed. One of my favorite things about this site is that they are super affordable! They have a $10-$20 section, as well as an under $10 section. And these aren’t cheesy, cheapo gifts. 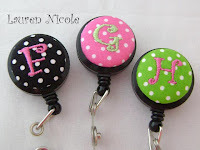 One of my favorites is the Monogrammed Badge Reels and Lanyards section, almost all of which are under $10. As almost everyone I know wears an ID tag at work, whether they are teachers, work at the hospital, or at any of the public service buildings, these are definitely going to be a favorite for my gift lists! There are many patterns and colors to choose from, my favorites are the dot ones. They also have some great hair accessories I might just have to order for my niece when she gets a little older! This site has lots of great items from pet accessories to personalized baby blankets and onsies. I also love the monogrammed handbags, I am a big pink and green fan, so the one pictured at left is the one I would choose. But there are lots of color combinations, size and types of bags, and monogramming fonts and styles! But my favorite thing that this site does is the unique, one of a kind jewelery pieces. They have some amazing items, like their line of photo jewelry. I had the pleasure of picking the Hand Stamped Mommy Silver Necklace. The photo on the website is pictured at below… Especially since this is my first review, I was very excited to get my necklace in the mail. It arrived quickly, shipped via the United States Postal Service Priority Mail. Lauren Nicole Gifts gets HUGE bonus points from me for shipping USPS, as we are a one income family and our sole provider is a US Postal employee. So we are very happy to see anyone who ships USPS! When I opened the box, the product was in a plastic bag, to protect it from any wet weather or mishaps. Inside the bag the item was beautifully packaged in a light pink organza bag and inside the bag was a silver tin with a lovely upholstered top. Inside was my necklace. I LOVE it! Since having Eli last year, and knowing he was my last child, I have been looking at many different “mother” pieces. I am definitely a stay at home, yoga pant or jeans wearing soccer mom. So I find this piece to be more my style than most of the stuff out there. Beautiful and practical for everyday wear. 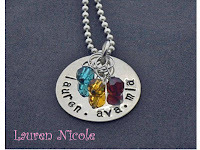 The charm was hand stamped with all four of the boyz names, and the spacing was done beautifully. When I look at it I see my sons names making a complete perfect circle, exactly how I feel about them! The beads are 6mm Swarovski crystal beads that are the boyz birthstones. I was so excited to see all the colors together! When looking at the chain on the website I was a bit concerned it was going to be almost reminiscent of a dog tag ball chain, but when I received the item that was my biggest surprise! It is very petite and lovely, not at all like what I had pictured in my head. It is definitely a light silver chain, as opposed to the heavy steel darker color I was thinking. In fact, the whole piece is a beautiful light silver. I have gotten a lot of compliments on the necklace already in my typical mommy travels. The ladies at the grocery store loved it, as did the moms at the little league game! My husband loves that I like a piece enough to actually wear it daily, as opposed to only on a Sunday for church. And the boyz like picking out their names or their bead color while sitting on my lap. I find myself reaching down and fiddling with it and smiling. Thank you Lauren Nicole Gifts! But not only has Lauren Nicole Gifts given me a Hand Stamped Mommy Silver Necklace, they have graciously agreed to give one away to one of my readers! Especially since this is my first giveaway, please be careful to read all of the instructions for entry into the giveaway! To enter the Lauren Nicole Gifts giveaway, please visit their website. Pick your favorite item and then come back here and leave a comment telling me what that item is. YOU MUST DO THIS FIRST OR OTHER ENTRIES WILL NOT COUNT. Please be sure that your profile has your email right on it, or be sure to leave your email address in your comment. This giveaway is open to US residents only. The Lauren Nicole Gifts Giveaway will close at 11:59 pm on June 14th. That’s the one I love…great job on your first review and giveaway!! I love the necklace!! Having 4 kids myself I know it is hard to find a “mommy” necklace that does not look tacky with so many names and birthstones. I can’t wait to see it in person!!! Wow! They have so many nice things. I love the necklace you received. I also like the Hand Stamped Silver Wedding or Anniversary Necklace and the personalized key fobs. Thanks! My favorite is definitely the hand stamped Mommy necklace – just beautiful! THe Hand Stamped Sterling Silver Necklace with 1/2″ Charm & Beads is SO pretty! Thanks for the cool giveaway! There is beautiful things on that site. I think I am going to buy a wedding one for a friend who just got married, but for me, I would choose the Hand Stamped Silver Mommy Necklace… BEAUTIFUL! Ceramic Initial Necklace – White with Pink & Green Stripes.. it's so cute! I really like the Bronze Swirl Heart Necklace! I have seen Lauren Nicole stuff before and I LOVE it!! I have to say the Hand Stamped Necklaces are my favorite and I really like the stacked mommy necklace too! I loved the necklace as well. Great idea for your first giveaway! I've seen these products in stores, and I love the monogrammed button sets in particular. They look great on Vera Bradley bags. I love the silver necklace with your kids' names. So precious! I just became a follower of your blog! I also follow you on twitter as _Mom_23 Tweeting for June in the Sling & Swaddle Journey! Oohh, I love the ladybug stamped necklace. We call my oldest daughter, “Bug”. I follow you an Twitter and on Bloglines! I would love a Hand Stamped Silver Mommy Necklace. It is so pretty and would represent my babies perfectly! Congratulations on your first giveaway! How exciting! I liked reading your review very much. My favorite thing at the Lauren Nicole site were the ceramic earrings – so fresh and cute! The white with pink and green were my specific faves. I'm following you – publicly of course – and proud of it! I faved you on technorati. I'm mom2maya. I also like her Preppy Pink & Green Lampwork Bracelet with Initial. Thanks for the giveaway! Added button to my blog scroll! I love the wax seal initial necklaces! 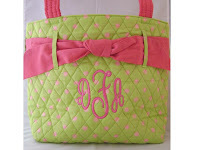 I love the Pink & Green Argyle Monogrammed Quilted Bag!! I love the Hand Stamped Sterling Silver Necklace with 1/2″ Charm & Beads! I cked out the site and like the Hand Stamped Copper Jewelry. Very pretty!